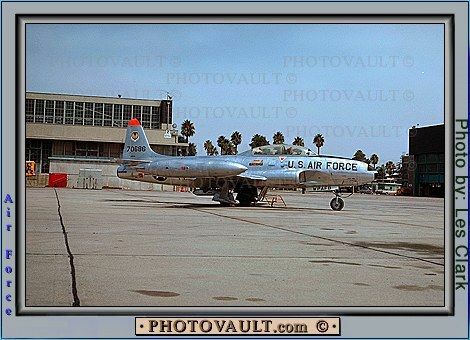 By 1960 the Cold War had heated up to the point that in Strategic Air Command (B-47's) we were getting very little flying time - only about one flight per month. Instead, we were spending nearly all our time on alert with the planes loaded and "cocked," ready for war. At my base in Savannah, while on alert duty we lived in an underground bunker and the planes were parked between revetments to help protect them in case of attack. Perhaps because of this, SAC duty was unpopular as a choice for new pilots, and SAC was getting replacements from the lower end of the graduating classes. 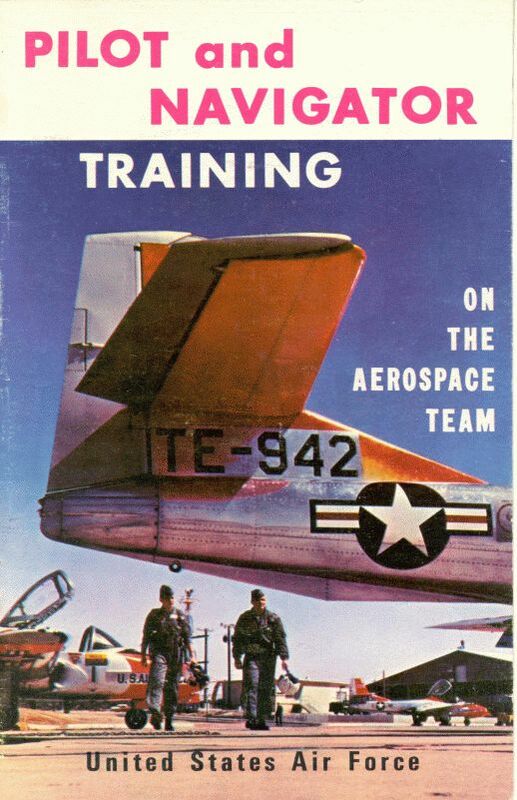 Therefore SAC initiated a program of sending a few of its pilots to Air Training Command to be emissaries for SAC during their duty as flight instructors. I applied for this and was accepted. First, along with others, I was given a tour of the SAC Headquarters "Underground" command center to see how we would respond to a large attack on our country. My assignment was to Webb AFB, only about 100 miles south of Reese AFB where I had been stationed for my first tour of instructor duty. My family lived in on-base housing for the entire three years. 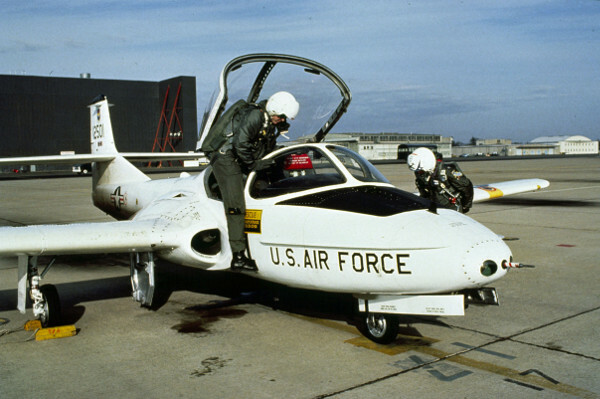 We flew the T-33 aircraft for about one year, then transitioned to the new T-37. I have lost all my photos of these two aircraft, so I have downloaded two from the web. I was sent a second time through Air Force instructor pilot school at Selma. At first I had a hard time with formation flying, because I was accustomed to heavier airplanes, but with a little practice it became easy. The plane had a powerful cabin air conditioner, and if one had the temperature control turned all the way down during takeoff it would blow snow in the cockpit. Later when these planes were phasing out, I was assigned to fly one to "the bone yard" (long term storage) at Davis Monthan AFB, Tucson, and the temperature control got stuck in the full hot position. That flight was miserable to say the least. As this was my second time to be an instructor, I asked to be assigned to be primarily a classroom instructor and secondarily a flight instructor. I was made primary instructor for Navigation for Pilots, backup for Principles of Flight, and flew with students regularly assigned to other flight instructors. 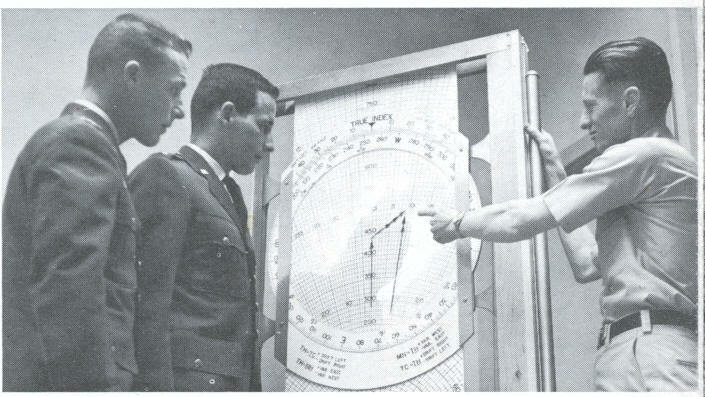 Because of my involvement with Principles of Flight, I got to attend the Navy flight instructor school at Pensacola, where they had some aircraft fitted out for observing angle of attack - vital for successful landing on aircraft carriers. There was very little storage room for baggage on a cross-country flight, so we would occasionally carry a travel pod hung under the fuselage. That increased fuel consumption, but we had planning factors for this. On one flight from El Paso to Reno, Nevada I was carrying some kind of replacement part for a T-37. We were flying at night, mostly in the clouds, and there was a strong wind which had veered around to be more of a headwind than forecast. It became evident that we were in trouble, but there was no alternate airport along the way - only near our destination. On that flight I had to declare a "low fuel emergency." With the red low-fuel warning light showing and about 10 minutes to go, I decided that we didn't have enough fuel to make the normal jet penetration. We could see the light of Reno through the clouds, and the cloud "ceiling" was high enough for visual maneuvering, so I descended straight ahead toward the city and made an emergency landing at the Reno destination airport. We made it to the parking spot without a flameout, but it remains in my memory as probably the scariest flight I ever made. 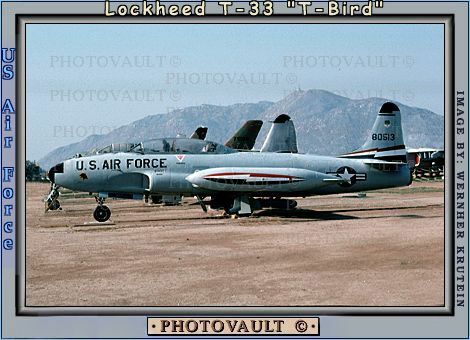 Toward the end of my three-year tour, the T-33 was phased out and replaced by the T38. Since I had been selected to go next to Air Force Institute of Technology, I never had opportunity to check out in that aircraft. However, I did have a couple of rides in it and experienced supersonic flight. The T-37 was almost a toy. It was designed as a trainer and powered, I was told, by two missile engines. The cabin was not pressurized, so we had orders not to fly above 22,000 feet - I think it was. Pilot and copilot had identical instrument panels. It had a high-lift wing and was designed to withstand vigorous acrobatics. We could do inverted spins in that aircraft - a really wild maneuver. 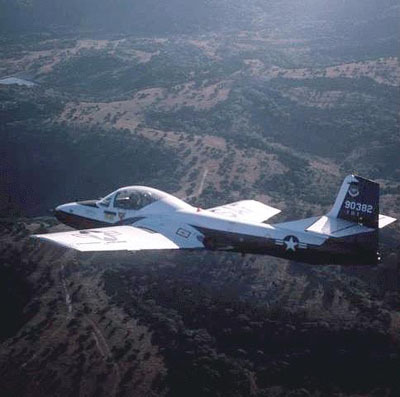 To give an idea of how "wild" an inverted spin can be, when I went to the Navy flight instructor school, we practiced inverted spins in a T-34. After those flights, the person in the back seat would usually come to class the next day with bloodshot eyes. This picture was taken from the web, and I think it was preparation for the final flight of the T-37 as part of the retirement ceremony. 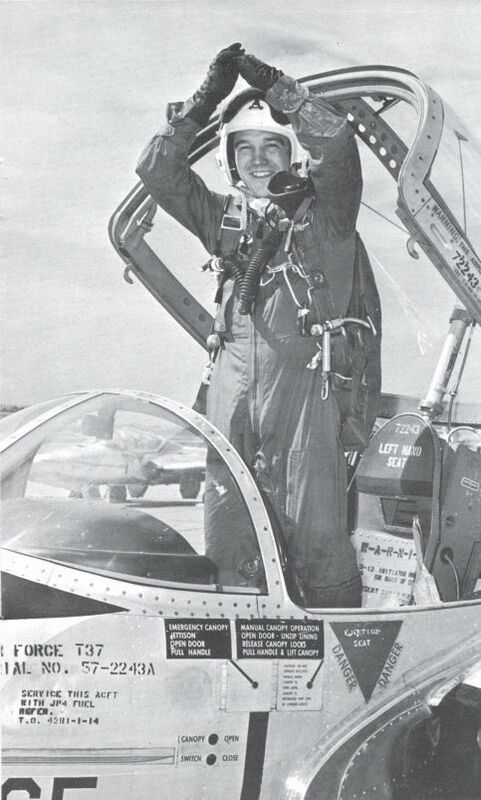 The remaining photos are from an Air Force brochure that was made up while I was stationed at Webb. Some people came from Training Command headquarters and took photos. I didn't know until after I had transferred to my next station that I would be in it. My picture is shown in the Navigation classroom as we look at a training device. The first photo is the cover. Next is the Navigation classroom. Third is "First Solo." I never got to fly that plane solo. Generally speaking, solo flight is considered a waste of resources.